Save your existing voicemail messages. Record important phone calls. Fast, easy and inexpensive! Capture those treasured first words! Save important messages without any extra hassle. Remember those happy memories forever! Important calls can be saved for years, and downloaded and emailed at any time. Crystal-clear recordings are a great business investment! SaveThatCall is a dial-in audio recording service offering MP3 and WAV downloads. Try it for free and pay only for the recordings you want to keep. No surprises or hidden fees. Call your voicemail to play back and save existing voicemail messages for permanent safekeeping! 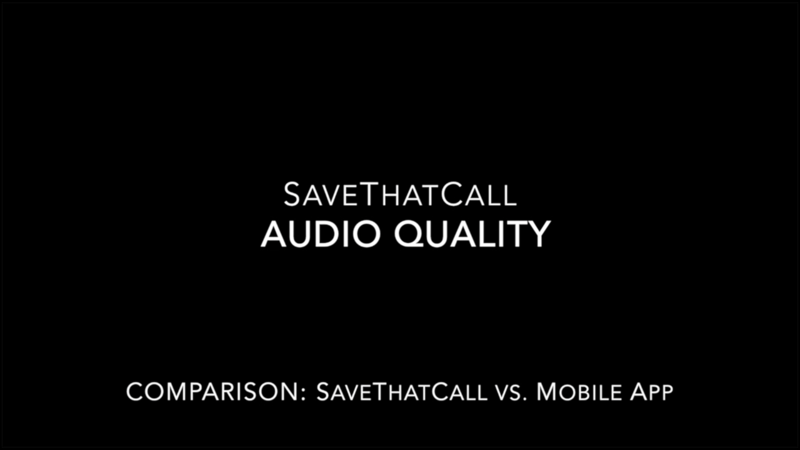 Hear the difference: Compare the alternative side-by-side with SaveThatCall. SaveThatCall is easy to use and offers a recording quality Guarantee. No contracts, prepayments, or minimum charges. Most people pay less than $2 ! $1.99 for recordings up to 10 minutes, only $1.00 per 10-minute increment thereafter. Review and pay only for the recordings you want: No surprises or hidden fees. SaveThatCall takes privacy seriously. Your information will never be shared. Secure identifiers authenticate access to your recordings. Links are sent directly to your email, so only you have access to your recordings. All access to SaveThatCall is conducted via HTTPS - the same protocol your bank uses. For more information, please see our detailed More Info page or feel free to Contact Us. We respond to all inquiries as soon as possible, usually within two hours! If you've purchased a SaveThatCall prepaid card, access your recordings through the Prepaid Login.